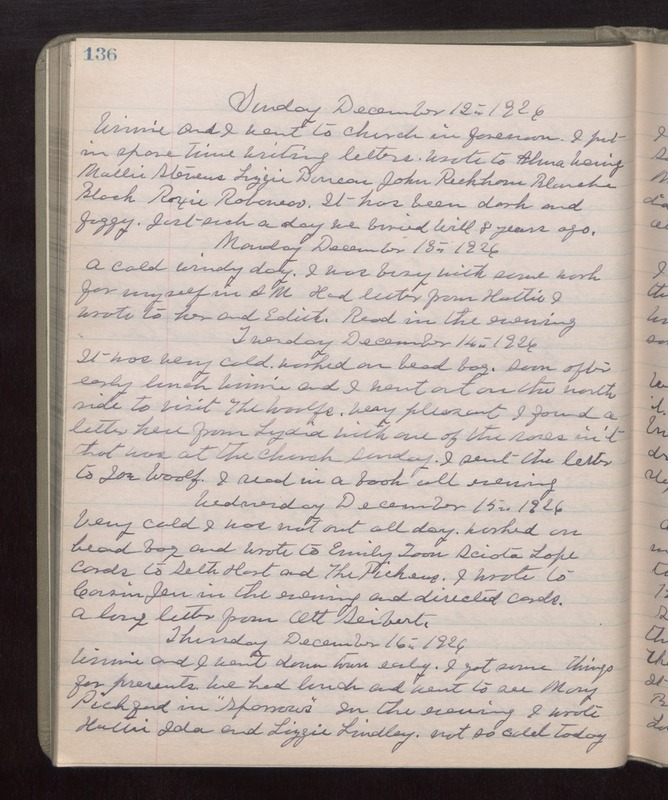 Sunday December 12th 1926 Winnie and I went to church in forenoon. I put in spare time writing letters. Wrote to Alma Wenig, Mollie Stevens, Lizzie Duncan, John Peckham, Blanche Black, Roxie Robaneau. It has been dark and foggy. Just such a day we buried Will 8 years ago. Monday December 13th 1926 Cold windy day. I was busy with some work for myself in AM. Had letter from Hattie. I wrote to her and Edith. Read in the evening. Tuesday December 14th 1926 It was very cold. Worked on bead bag. Soon after early lunch Winnie and I went out in the north side to visit The Woolfs. Very pleasant. I found a letter here from Lydia with one of the roses in it that was at the church Sunday. I sent the letter to Joe Woolf. I read in a book all evening. Wednesday December 15th 1926 Very cold. I was not out all day. Worked on bead bag and wrote to Emily Toon, Sciota Lape, cards to Seth Hart and The Pickens. I wrote to Cousin Jen in the evening and directed cards. A long letter from Ott Seibert. Thursday December 16th 1926 Winnie and I went down town early. I got some things for presents. We had lunch and went to see Mary Pickford in "Sparrows." In the evening I wrote Hattie, Ida, and Lizzie Lindley. Not so cold today.